At first the answer might seem simple. Christians sometimes urge people to "remember the true meaning of Christmas". They assume that people will think this has to do with the historical birth of Jesus of Nazareth. Other Christians, mostly radical Protestants, more rationally but less popularly eschew the celebration of Christmas, regarding it as a pagan custom that actually has no roots in the Christian faith. In this they are certainly correct. There is no evidence at all, nor is there any Biblical or other tradition, to suggest that the birth of the historical Jesus of Nazareth took place at midwinter. And in fact the Biblical references to both shepherds and the taking of the Roman census indicate that whatever time the historical Jesus was born, it was unlikely to have been midwinter. Shepherds were not employed during the winter, and censuses were not taken in winter owing to the increased difficulty of travel. So what is the true meaning of Christmas? The great midwinter festival was important in many "pagan" religions, and it was in order to co-opt this that the Christians first decided to celebrate the birth of Jesus at midwinter. But what was that festival? It varied somewhat between religions. But fundamentally it was the "celebration"—or ritual enactment—of the Birth of Light in the darkest moment of the year. In order to understand this in the light of the Mother Religion—to understand what Déanists and Filianists are doing when they celebrate Nativity—we need to understand a little about the nature of our Faith (and traditional faith in general, outside of the aggressively exclusivist Abrahamic traditions). We have written on this subject here. The Filianic tradition, as well as its Déanist friends, celebrate what we call Nativity within the framework of the narrative of the Birth of God the Daughter in The Gospel of Our Mother God. Some critics have objected that this particular narrative is not in itself universal and is not likely to have been the original story of the midwinter festival. The problem with this criticism is that it is absolutely ensnared in the childishly literalistic perspective of modern Christianity and of its twin-antagonist "scientific-historical rationalism". We do not claim and have never claimed that the Gospel story of the Birth of God the Daughter is the only possible narrative of the true Midwinter Event. Neither would we (as do historical rationalists, including both atheists and some Christians themselves) accuse the Christian Church of perpetrating a "pious fraud" in assimilating the birth of Christ to the midwinter festival. Actually, it was a perfectly rational and proper metaphysical assimilation. The only fraud consists in the transparently false claim that the Christian version is the unique and original source of the Christmas/Midwinter Event, somehow unconnected with the Universal Tradition. So again, what is the true meaning of Christmas? What is the Midwinter Mythos at its very heart? It is the story of the Encroaching Darkness and, at the darkest point of the year, the birth, at first tiny, but destined to grow rapidly, of the Light. "Historical rationalists" will trot out their weary claim that this is a "mythologization" of the facts of nature by ignorant "early man". That is the rationalist pseudomythos: the current Western picture-story of the world. The truth from the metaphysical perspective is the exact reverse of this. The rhythms of nature are merely the echoes of Eternal Truth on the material plane. In this case we are dealing with a fundamental truth of manifestation: the centrifugal tendency of all that is not the Absolute away from the Divine Center. This is expressed in history through the decline of the ages. In the cycle of the day, it is expressed through the onset of night. In the cycle of the year, it is expressed through the coming of winter. It is a cycle because God sustains Her creation. She does not let manifestation fall into the Dark Night. Truly, all the cycles of the times and the seasons; all the rhythms of the soul and of the mind and of the flesh: truly all these flow from the love of our Lady the Maid, that creation may not decompose, each several member flying away into black eternal chaos. We may see the rhythm of the year (like all other rhythms) in terms of the fundamental yin-yang rhythm of being. In the traditional yin-yang mandala shown here, the point of Nativity is represented by the white dot in the midst of the black section of the mandala. What we should note here is that from the point at which the Light is born (the white dot) the white begins to grow. Although the darkness will still appear to increase, as you see from the final bulge of the black section, the months after midwinter being the coldest and darkest-seeming, still the light is growing from the winter solstice forward. 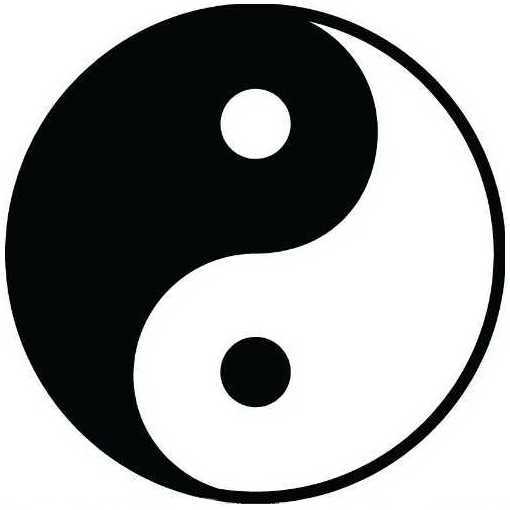 In respect to the birth of the Daughter as Yang or Light, it should be remembered that the Daughter is Yin in relation to the Mother, but Yang in relation to manifestation (or "the world"). This is precisely Her function as Priestess of the World. The black seed at the summer solstice-point, by the way, is the irreducible element of darkness that must exist in manifestation even at its brightest. This, then, is the true meaning of Christmas, or the Winter Solstice Event. The "natural" triumph of darkness, in a world whose "gravitational" pull is always downward, interrupted by the miracle of Light at the very darkest point. The full truth of this miracle is something we cannot fully understand with our time-and-space-bound minds. 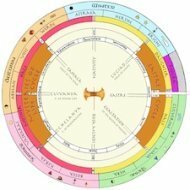 However, it is providentially conveyed to us, firstly in the cycle of the year and secondly in the various inspired Myths that interpret it to us. We should always bear in mind that true Myth is not below the level of fact, but above it: speaking not of the accidents of a particular world or time or even of a particular universe, but of those Eternal things that cannot not be. 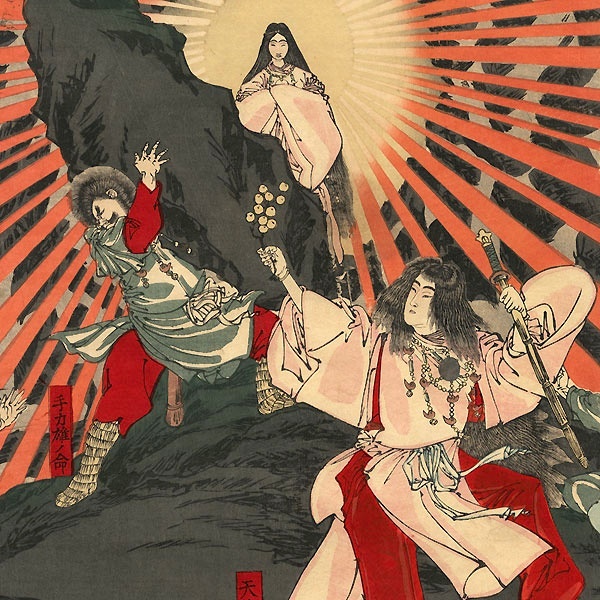 Given that, for the vast majority of human history, the Divine Image was always female, it goes without saying that the Great Lightbringer of the Winter Solstice was originally depicted in feminine form, as She still is in such traditions as that of Amaterasu Omikami, the supreme Japanese Goddess of Light who comes out of her cave to return light to the world at the winter solstice. All about Nativity: The Birth of God the Daughter is the central Event of the Filianic Midwinter High Festival. Read about it here. Winter Solstice Celebrations: The universal reality behind a ubiquitous festival. Janua Coeli, Gates of Heaven: How the Summer and Winter Solstices are mystical gateways that lead beyond this world. The Christmas Tree: History, Meaning and Symbolism: A look at the history of the Christmas tree and its origins as a symbol of devotion to Our Mother God.